Spirit digs into dune high up on Husband Hill. Now at the crest of "Husband Hill," Spirit is master of its own domain. The robot is on the lookout for possible routes into a basin to the south with apparently layered outcrops. Trekking down from the hill, a target is "Home Plate". The inner basin area of the Columbia Hills contains a broad range of interesting geological targets, including Home Plate among other possible layered outcrops. But Spirit's stay time at the Summit is difficult to predict, said Steve Squyres, lead scientist at Cornell University for the Mars Exploration Rover effort. "Rather than setting a firm departure date, we've established a short list of things we have to get done before we leave the summit," he told SPACE.com. That list includes stereo imaging of the south and north sides of the hill. Use of the robot's instrument tipped mechanical arm on selected features on the summit is also slated. Panoramic camera sweeps of the east side is to be done as well, with photos of the south side already wrapped up. "Once we've finished the rest of the list, we'll start the descent," Squyres said. Squyres noted that the Spirit and Opportunity rovers have received yet another six-month extension from NASA Headquarters to keep operating. An earlier commitment of 18 months of funding is contingent on a successful science review of rover work once every six months, he said, with the first review of three recently taking place. So on Mars, the rovers troop onward. 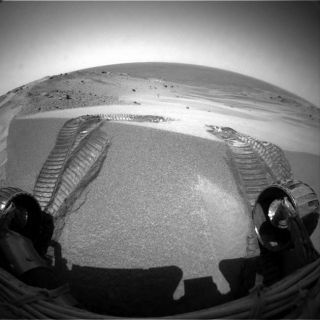 "For Spirit, we're going to head down the hill, looking for bedrock and heading toward Home Plate," Squyres concluded. "The 'Home Plate' feature looks very intriguing," said William Farrand, a research scientist at the Space Science Institute in Boulder, Colorado. He is also a science team member for the Spirit and Opportunity rovers. Farrand said examining one of the dunes in the summit area is on Spirit's agenda. The rover hasn't done an on-the-spot trenching and examination of a dune since about sol 73 of the mission, Farrand advised. "With the prominent dunes on the summit area, an examination of one of them has been accorded a high priority," he said. A "sol" (Latin for "sun") is the Martian equivalent of a day in reference to the planet's period of rotation. Some of the recent images from Spirit also show what looks like rock outcrop. Accordingly, examination of those features is also on the list of "things to do", Farrand said, as is snapping a panoramic view of "Cumberland Ridge" – a portion of Husband Hill. That's the ridge that Spirit drove along to get to the summit, studying Methselah and related outcrops along the way, he said. Sorting out the true makeup and origin of the Columbia Hills is challenging, said James Rice, a science team member of the Mars Exploration Rover Project at Arizona State University in Tempe, Arizona. Rice explained that the Columbia Hills form a rugged ridge complex comprised of 7 peaks spanning some 2.2 miles (3.5 kilometers) in length and reaching a maximum height of 348 feet (106 meters) above the plains of Spirit's landing site within Gusev crater. That high point is Husband Hill, he said. "Thus far the origin of the Columbia Hills has remained elusive despite detailed analysis of numerous rock and soil targets, including outcrops," Rice said. The chemical differences among distinct rock classes found there to date attest to the diverse nature of the hills and their geologic complexity, he said. How long Spirit will stay on the summit is also driven by changing climes on the red planet, explained Mars rover science team member, David Des Marais, an astrobiologist at NASA's Ames Research Center, Moffett Field, California. "The team recognizes that the rover must starting driving south before too much longer so that she can explore the southern flanks of Husband Hill and the lowlands beyond before winter arrives in the southern hemisphere," Des Marais said. Spirit has been acquiring large, high quality landscape views of the basin to the south of Husband Hill, Des Marais said. Those assignments are designed to locate future science targets and to identify potential routes down the hill, he said. "Before the winter season in Gusev, we plan to drive into the basin to the south of Husband Hill to regions where Spirit can 'over-winter' on slopes that face north and thereby capture more solar energy," Des Marais told SPACE.com. Relatively extensive areas with north-facing slopes are about 5,000 feet (1.5 kilometers) straight-line distance to the south of Spirit's current location, he said. While Spirit rolls around the summit in scientific bliss, the Opportunity rover in Meridiani Planum has had its stops and starts. And even rodents on Earth caused a bit of a problem. "For Opportunity, we're going to continue south through the etched terrain, studying bedrock as we go and heading toward Victoria crater," Squyres said. But it hasn't been easy going for Opportunity of late. Contrasted to Spirit's tour of duty, "life has been a bit more frustrating lately over on the other side of the planet," Squyres recently noted on his Cornell University-based Mars rover web site. Opportunity experienced an unexpected "reset" – a spontaneous rebooting of the onboard computer. "We don't know why it happened, and while it's not deeply worrisome, it is a puzzle that we've been trying to solve," Squyres reported. "Unfortunately, recovering from something like a reset is a slow, lengthy process. You don't know what caused the problem, and the immediate concern is that whatever triggered it will do it again next time you try it. The thing you have to do is fire up each of the rover's capabilities one at a time, checking each one carefully and individually to see whether it would cause another reset or not. Standard spacecraft troubleshooting practice...but it takes time," Squyres explained. There is good news, however: The whole rover now has a clean bill of health, given that no new resets have been triggered. "The root cause of the reset remains a mystery, but I guess the occasional odd glitch is to be expected from a vehicle that's been on Mars for almost 600 sols," Squyres said. Just as the clean bill of health was given to Opportunity, arguably one of the oddest incidents impacted the robot's science gathering. One Mars day of work was lost when rodents at one of NASA's desert-situated Deep Space Network tracking stations gnawed their way through insulation, shorting out a cable, Squyres explained. "Easy problem to find and fix, but it happened at just the wrong time and cost us data, and one more sol," Squyres said, adding: "Another first for the Mars Exploration Rover Project."